Great Video as usual. Concerning the storms that blew up near Mankato and Rochester early in the morning. I agree that there was no forecast that showed that kind of rain affecting the RST area, there was not one single model that showed that. Having said that ( I wished I would have posted my thoughts before hand here), I felt fairly certain that the models were dropping the cold front to far south, as there was a expansive surface ridge just SE of MN on the order of 1018 to 1020 mb, while that was not a real strong ridge it was quite expansive. All the models were showing the cold front pushing that aside like it was a feather. While a stronger cold front could do that, I thought the front was rather weak as highs the next day were progged to be in low to mid 80's, the biggest change was the drop in dew points and a weak wind change out of the NW. So I was not surprised to see those storms. Concerning the Excessive Heat Warning that proved to be a bust, I saw nothing out of the models that would suggest that, very little RH values were suggested from 700mb on down that would have supported cloud cover coming in, I think it was the right call. A excessive heat watch is up for next week, and it is well warranted. While some people excel in in very hot weather, most do not. The problem with heat is not the daytime highs but the night time lows. I wouldn't be surprised to see night time low's in metro around 80°, and that would not let people without a/c a chance to cool down. If you go to the state fair I would recommend the following for someone that doesn't do well in the heat like me. 1) Drink at least 2 liters of water and 1 liter of Gatorade before you go. 2) Do not consume soda or alcohol while on the fair grounds, get as much free water as you can drink. 3) This is the most important IMO, wear a large brimmed straw hat that will shade your head, AND bring a towel that is large enough to wrap around your neck, soaking it with cold water from time to time will help keep your core temp lower, as it acts like a cold compress if you keep it wrapped around your neck. Good luck everyone next week and remember to check on you elderly friends and relatives, not just a phone call but take time to drive to their places and make sure their A/C is working. REMEMBER HEAT IS THE NUMBER 1 WEATHER KILLER!!!! Day one convective outlook has been posted, the metro is the middle of the slight risk area....2% tornado, 15% wind and hail. Not sure if I believe that or not, the Nam shows it, but most of the global models keep it in WI. Thanks, B. Yesterday, in addition to the sweltering heat, I had Johnny Cash singing in my head for the better part of the day... ;-) 80 degrees at 7:00 this a.m. Yikes! Great video. Fun to learn about the Ring of Fire. Hope everyone is safe outside these next few days. Overnight (Sunday morning) low of 80 set a new record, blowing away the old record of 74. It's also the latest in the year there has even been an 80+ daily minimum. This morning's minimum was also right around 80; the record for today is 75 (in 1991), so we'll set another record. There have never been consecutive 80+ daily minimums in August. The intensity of this heatwave, this late in the summer, is pretty rare. Another warm dry week is setting up. Keep a eye on the severe threat for late next weekend. Although it's a long way off, late next weekend looks interesting according to the models. Barring a major change in the mass fields it looks like some of us in MN could get some decent rains. The finer details have yet to be worked out, but severe weather is not out of the question. A interesting development is being depicted by both the 09/0z run of the NAM and the last 4-5 runs of the HRRR. Both develop a area of 2.2" of precipitable water over the metro in the early to late morning hours. The HRRR is a little faster (by about 2hrs) in bringing convection into the metro, thus dropping about 1-2" of rain before 10am, while the slower NAM model drops heavy rain just west of the metro before a cap forms over us and dry's us out. On the other hand the Nam later in the day is suggesting a bout of severe weather just north and east of the metro....lets hope for some rain. Models were hinting at this scenario with their 00z runs too, but it seemed robust when considering the potential 'CAP' and warm surge of air that we are experiencing this AM. There was no doubt that an MCS would develop over MN, but it was highly questionable if it would track across the MSP metro. Well, I guess we now know the answer to that. Still just 71 at 9am. It's a long way to 100. Once again the cap holds court. Kind of frustrating the last couple of months, while some decent rain chances have been around from time to time, we have just not seen a strong enough forcing mechanism to break the cap. Zero negative tilted troughs at H5, or a strong surface low pressure to break it. Looking to next weekend as the best chance of rain, I think the opposite may be a problem, that cooler drier air may get here before they rain does, forcing it south of the metro, if not all the way into IA. For those of us that are weather geeks, here is a good look at what one long range forecaster is calling for this winter. I don't know who this person is but when he put out his severe weather outlook this spring, Greg Carbin of the SPC staff left a note in the comments section that he agreed. As you can tell it takes some time to put out a detailed forecast like this one. I may not be able to do it this year as I am working more hours than agreed upon, which in some ways is a good thing. There are some things I don't agree with, like comparing his analog years with the long term period of 1950-1995, I would rather he compare them to the 30yr climo period of 1981-2010, these weather patterns today are not what his grandfather encountered. Drought Index for each of those three months, along with the 3 month period. His top analog years are 62-63 and 2008-2009 and those may be good years, but however I think any serious winter forecast will have to deal with this years very slow start to the Atlantic Hurricane season. Concerning rain chances for Saturday. I took a quick look at the ECMWF and the GFS and the dew point/temp spread at the surface for both Owatonna and MSP off the Euro, and MSP off the GFS. When rain starts at both locations the difference between surface dew points and surface temps is somewhere around 25° if not as much as 30°. For instance the ECMWF according to weather spark at Owatonna shows rainfall starting when the surface temp is near 70 and the dew point temp around 40. That's way to dry for rain to reach the surface. The models may show good saturation between 925mb and 700mb but I wonder how much will reach the surface, at this time I would suggest cutting the model QPF by 50% if not by 75%. I would ideally like to see the surface temp/dew point spread around 12-15°. What a interesting day today was (Sept the 19th), while most forecasters (including me) expected storms to fire off along the approaching cold front, crashing into 1000-2000 cape values some time between 1pm and 4pm for the metro area, we actually saw early morning storms in SW Minnesota moving SW to NE along the warm front, as they continued to move to the NE just west of the metro they dropped 1.5 to 2.0 hail from the Big Lake area towards Cambridge. By the time the cold front got to the metro we were rather stable. My question to those that read this, was there any media outlet whose pro met forecasters actually called for severe storms during the morning hours, with conditions stabilizing during the afternoon, 24 to 12hrs in advance? Thanks in advance if you respond to this question. I agree, Randy. Everyone seemed focused on the timing of the cold front and talked mainly about storms between 1 p.m. and 4 p.m. as I recall. What about the rain coming? It seems like a really drawn out event. I am loving this late fall summer weather and wondering if this rain is going to signal a major pattern change. I would like the weather to stay warm as long as possible! 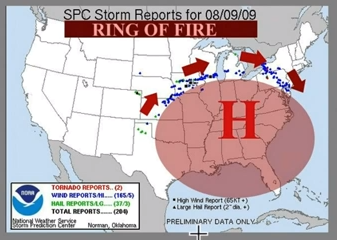 Bill/Tom - how about a new vid covering the potential of Severe Wx in So MN. Tom can go into the "Triple Point" theory and what it means. We'll try to do that tonight. Thanks for the encouragement. Major low coming through, I am surpised to see winter storm watches almost all the way to Pierre. In fact, They could be extended as far east as perhaps the Aberdeen/ Huron area. Potential indication to what winter may bring?